In this portrait, Charles de Guise is shown wearing the red hat and gown of a cardinal. He was a powerful figure at the French court and an uncle of Mary, Queen of Scots. This exceptionally large oval plaque comes from a series of portraits of eminent figures, each surrounded by smaller plaques and set into elaborate frames. They were probably displayed in room panelling and were an important commission. It is possible that they were created for Henri II and his queen, Catherine de' Medici. Enamels by Leonard Limosin have always been highly valued and much admired for their originality, diversity, artistic merit and technical skill. Born in about 1505, Limosin is thought to have trained in the Penicaud family's enamelling workshop in Limoges, later developing a large workshop of his own. He worked in coloured enamels as well as in grisaille and made decorative wares as well as plaques. His subject matter included mythological themes, the months, saints, Biblical subjects, and portraits (his particular speciality). In about 1534, Leonard was invited to the court of Francois I and from then on divided his time between the court at Fontainebleau and his workshop in Limoges. His style and ideas were influenced by his association with Italian Mannerist artists at court. Limosin went on to serve French kings Henri II, Francois II and Charles IX. He produced numerous enamel portrait plaques of rulers and courtiers, some after drawings by Francois Clouet. 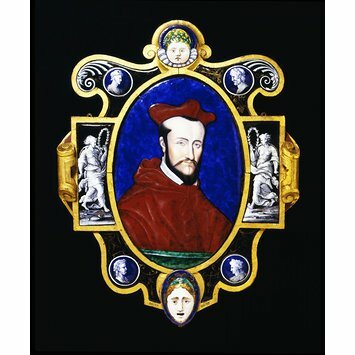 Oval plaque painted in polychrome enamels on copper with a portrait bust of Charles de Guise, 2nd Cardinal of Lorraine (1524-74). He turns slightly to his left. He wears a cardinal's red hat and gown. His eyes are light blue and his receding hair, long thin moustache and short beard are a very dark brown. He is portrayed against a dark blue ground and behind a (conventional) dark green parapet. The whole plaque is set into a painted and gilt wood (probably oak) frame inset with six small enamel roundels and two narrow almost rectangular plaques. The roundel at the top of the frame is embossed with a child's face crowned with a wreath of ivy leaves. The roundel at the bottom of the frame is also embossed in the form of a female mask-like face with open mouth. The other four roundels are small classical profile busts painted in grisaille. The narrow plaques flanking the main portrait depict allegorical figures bearing laurel wreaths again painted in grisaille. These are copied from the angel holding the crown of thorns by Niccolo dell' Abbate, enamelled by Leonard Limosin in 1553 for the Sainte Chapelle. Charles de Guise was born in Joinville, France, in 1524. His father Claude de Guise was created 1st Duke de Guise, a cadet branch of the ruling house of Lorraine, by Francois I (1496-1563). Charles' mother was Antoinette de Bourbon (1494-1583), and his sister Mary married James V of Scotland and was mother of Mary, Queen of Scots. Charles became Archbishop of Reims in 1538 and founded the university there. He became Cardinal of Guise in 1547, a day after the coronation of Henri II at which he officiated. He became 2nd Cardinal of Lorraine after the death of the 1st Cardinal, his uncle Jean in 1550. Charles and his brother Francois de Lorraine, 2nd Duke de Guise (1519-63) began to rise to powerful positions at court during the reign of Henri II and effectively controlled the government during the short reign of Francois II in 1559-60. During the regency of Catherine de' Medici, the Guises lost their grip on power and, unhappy with the queen's tolerant religious policy, persecuted the Huguenots and brought about the Wars of Religion (1562-98). Francois de Lorraine was assassinated in 1563 but Charles regained his hold on power at court between 1567-70. 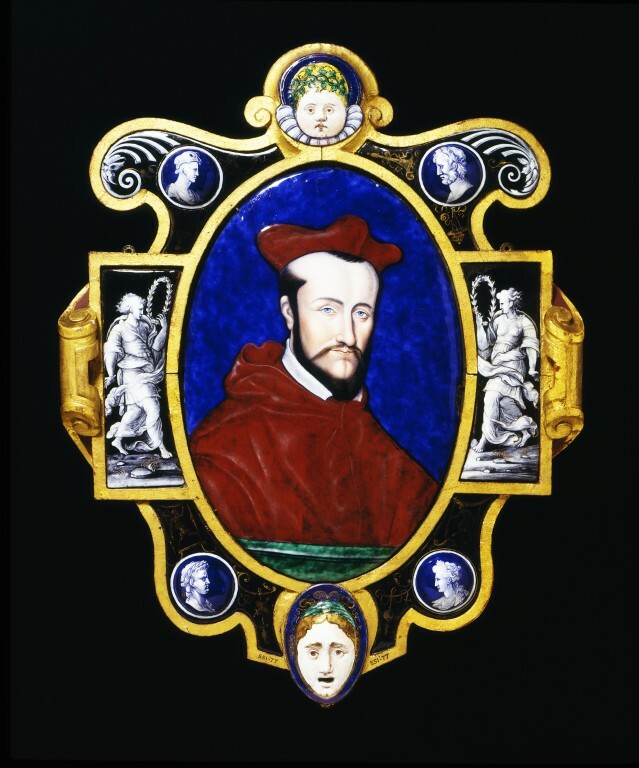 Francois' son Henri, 3rd Duke of Guise, helped plan the St. Bartholomew's Day Massacre of 1572. Charles, described as a consummate politician and master of intrigue, died in Avignon in 1574. An enamel in the Frick, New York, inv.16.4.22, "The Triumph of the Eucharist and of the Catholic Faith" shows members of the Guise family, including Charles de Guise, allegorically crushing underfoot well-known Protestant "heretics". The identity of the person shown in this portrait is confirmed by a portrait in an illuminated manuscript of 1547/48 as it is accompanied by an pyramid emblem and the Cardinal is the only person who used this emblem. Formerly in the collection of Henry Danby Seymour, Esq., M.P. (1820-77). Related to the Dukes of Somerset, he was M.P. for Poole 1850-68. He lent the plaque to the Special Exhibition of Works of Art of the Medieval, Renaissance and more recent periods, South Kensington Museum (later V&A), 1862. He also owned and lent to the same exhibition four other oval enamelled portraits in frames similar to the one surrounding 551-1877, although the identity of three of the sitters was uncertain. (Hollingworth Magniac also lent to the same exhibition his pair of Louis de Lorraine and a lady possibly Marie de Guise. He lent the former again to the 1874 Special Loan Exhibition of Enamels on Metal, held at the South Kensington Museum in 1874). Historical significance: Both at the time of making, and in collections now, the enamelled works of Leonard Limosin have been highly valued and much admired for their originality, diversity, artistic merit and technical skill. Born in about 1505, Leonard's surname is descriptive of his Limoges origin. He is thought to have trained in the Penicaud family's enamelling workshop. He developed a large workshop of his own in which other members of his family joined and later followed him. Leonard was also a painter and engraver. His oil painting on wood of the Incredulity of St. Thomas (the central panel of a triptych painted in 1551 for the Abbey of St. Martin, Limoges which had a finger reliquary of St. Thomas) is today displayed in the Musee Municipal de l'Eveche, Limoges. His first signed and dated enamel is from 1533. He worked in polychrome enamels and in grisaille, and made decorative wares as well as plaques. His subject matter was wide including mythological themes, the months, saints, Biblical subjects, and portraits (his particular speciality). Unusual enamel works by Limosin include a chess and backgammon board (1537), a fountain for Diane de Poitiers (1552), and a view of the siege of Calais (about 1558-60). In about 1534, Leonard was invited to the court of Francois I and from then on divided his time between the court at Fontainebleau and his workshop in Limoges. His style and ideas were influenced by his association with Italian Mannerist artists at court. He is thought to have been introduced to court by Jean de Langeac, an art lover, royal councillor and Bishop of Limoges (1532-41). He commissioned Leonard to make enamels for him bearing his arms. But another connection may have been Marguerite d'Angouleme, the king's sister and viscountess of Limoges by her marriage to Henri d'Albret, King of Navarre. The 1535 inventory of their chateau of Pau lists sixteen enamels. Leonard Limosin was appointed "peintre emailleur et valet de chambre du roi" by Henri II (reigned 1547-59) in 1548 and served Francois II and Charles IX in a similar capacity. An inventory of Fontainebleau's furniture lists works by Limosin from 1560. Major royal commissions included a series of twelve apostles made in 1547 for Henri II's chateau at St. Germain-en-Laye, and two altarpieces of 1552-53 for the Sainte-Chapelle. He produced numerous enamel portrait plaques of rulers and courtiers, some after drawings by Francois Clouet. The series of exceptionally large (about 45 x 32 cms) oval plaques in elaborate frames inset with smaller plaques, which included this portrait of Charles de Guise were clearly an important commission. It is possible that they were created for Henri II and his queen, Catherine de' Medici. In 1874, Edmond Bonnaffe published the 1589 inventory of Catherine's furniture and furnishings which listed 39 oval enamels which had been displayed in the panelling of her cabinet (room) and 32 portraits measuring about 30cms. in height. There is no proof that these portraits equate with the series of which the portrait of Charles de Guise is one, but Limosin worked at court and the series is an impressive one. Another of the series, with an original frame, is the portrait (1556) of Anne de Montmorency, High Constable of France (1493-1567) now in the Louvre (inv. N 1254). This one was confiscated after the Revolution from a Montmorency descendant in 1794 which implies that it may not have been a royal commission but done for Montmorency himself - a known patron of enamel painters, whose younger brother was Bishop of Limoges 1517-19. Also in the Louvre are two oval plaques of a similar size, one a portrait of Francois de Lorraine, 2nd Duke of Guise (1520-63) painted by Limosin in 1557 and the other a portrait of the Dauphin, later Francois II (about 1553). In the Taft Museum, Cincinnati, is a portrait of Francois de Cleves, Duke of Nevers (1516-62) which is also oval of a similar size and in a 19th century frame. Other portraits (5) appear to have been in the collections of Henry Danby Seymour in and Hollingsworth Magniac(2) in 1862. The Magniac pieces were lent again to the 1874 South Kensington Museum special loan exhibition, when it was claimed that the series was executed for Henri II and that three were then in the Louvre, five owned by Seymour, two by Magniac, and three in the collection of Baron Alphonse de Rothschild, Paris. Limoges, central France, was famous for the production of champleve enamels from the late 12th century until the town was destroyed by the Black Prince in 1371. The enamel industry began to revive about a century later but the technique of painted enamels produced from 1460s/70s was quite different from the earlier medieval work. The copper, probably from Spanish mines, was hammered to thin sheets. A plaque such as this would have been hammered to a slightly convex shape and coated with enamel (a mix of powdered glass known as flux and metallic oxides) front and back. The back coat, known as the counter-enamel, was necessary to retard oxidisation of the copper and to even out the expansion and contraction rate of the piece which helped prevent the precious painting on the front from cracking in the furnace. The design was outlined on the dark ground colour, then the image built up with a brush and spatula by adding different enamel colours in sequence according to their melting point. The piece might thus be fired eight or nine times, working from the highest temperature colour to gilding at the end. There was immense skill, perfected through careful experimentation, in producing the correct colour and shade required and a smooth correct consistency of enamel powder. The result, after much time and labour, had to be as free of bubbles, defects, specks of dirt and cracks as possible. A large well-executed portrait plaque of this nature would therefore have been a costly luxury item and specially commissioned. Crépin-Leblond, Thierry, et al, Marie Stuart: Le destin français d'une reine d'Écosse. Paris : Réunion des musées nationaux, 2008, p.13. ill., p.115. Carroll, Stuart. Martyrs and Murderers: The Guise Family and the Making of Europe. Oxford: Oxford University Press, 2009. Marshall, R. Mary, Queen of Scots: 'In my end is my beginning'. Edinburgh: NMS Enterprises Ltd, 2013. The carved, painted and gilt wood frame, though of some age is not considered to be 16th century. Some of the small enamel plaques are 19th century replacements but others might be 16th century (in particular the gold painting of the pyramid, the Cardinal's emblem).. Frames of this style are said to have been made in Florence by Benedetto Battini.